People in the Baltistan region of Northern Pakistan, and “next door” in Ladakh, Northern India, consider the snow leopard to be a part-land, part-water animal. They believe that there is only a female snow leopard. The female comes into heat on a full moon night, goes to the edge of a water body, a lake or a river, and calls to the male otter. The otter comes out of the water and mates with the female snow leopard. 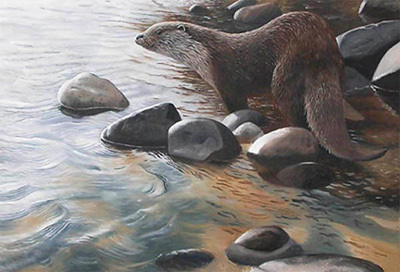 After copulation, the female returns to the mountains and the otter goes back into the water. At the time of birth the pregnant snow leopard comes again to the edge of the water and gives birth. A newborn male cub goes in the water and becomes an otter while the female cub goes in the mountain with the mother. In this story the snow leopard becomes a mythological character, symbolizing the mystical, almost magical character of nature. The story demonstrates that Baltis do not necessarily seek rational explanations of nature; in their world-view it is believed, and accepted, that nature is full of mysterious and unexplained things. In keeping with their wider world-view, the view of the snow leopard provides the Baltis with the opportunity to express their biophilia* tendencies in the form of engaging in a mental creative activity that revolves around an imaginative secret life of the snow leopard. Thanks to Shafqat Hussain, Rinchen Wangchuk, John Mock, and Matthieu Paley for reporting this myth. *Put forward by Edward Wilson (1993), the biophilia hypothesis states that humans have an innate tendency to associate with life-like processes found in the natural world, and that this tendency serves our vital biological needs. Kellert (1993) builds on Wilson’s theory and states that biophilia is biologically based, thus it is part of our evolutionary heritage and is associated with genetic fitness. He argues that biophilia exists because it gives humans an advantage in the evolutionary struggle to thrive as a species; this advantage derives from the fact that biophilia increases the possibility of humans finding meaning and personal fulfillment in their lives with their interaction with nature. The nourishment of these broader human needs contributes towards achieving the most fundamental goal of human species – its survival. Thus a disconnection with the natural world mainly through degradation of species does irreversible damage to the well being of humans, particularly in cognitive and evaluative respects, and ultimately limits the capacity of the human species to survive in the long term.